In Poland I have seen many amazing museums, each with something special about it. Some are completely immersive, others are making improvements on data collection, and yet others are controversial. If I had to attribute any defining characteristic to the European Solidarity Centre, it would be its design. The European Solidarity Centre in Gdansk is not merely a museum. While part is a museum dedicated to teaching about the Polish trade union Solidarity, it is also a “place to create the future.” The building also hosts cultural events like debates and conferences, has rotating exhibitions, is home to NGO offices and a publishing house, and has a large library. As our guide described, the European Solidarity Centre is intended to help people answer questions about democracy and freedom today. The building as a whole is unique. It is designed to appear industrial, to feel in part as though it is from the shipyard, much like the Solidarity movement was. There are high ceilings, steel walls, and concrete structuring. 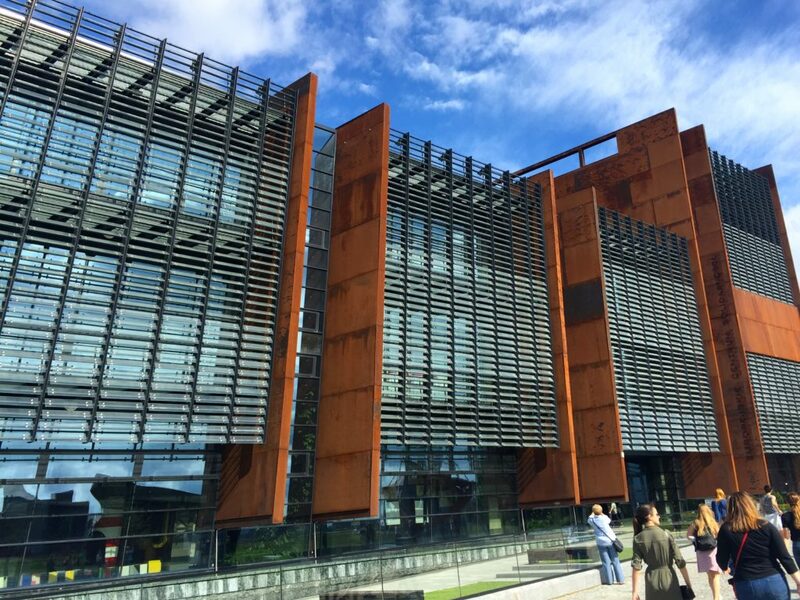 Most interestingly is the material used for the building: weathering steel, or COR-TEN. This material is meant to give the look of rust, as it in fact is rust. This type of steel rusts the exterior up to a certain point, which gives the center the look of a ship in a shipyard, adding to the feel of the museum. The museum portion of the European Solidarity Centre maintains creativity in design as well. There are six halls in the museum, each styled differently than the one previous. There were three that particularly stood out to me. The first was the entrance, the hall devoted to the shipyard strike. While most museums focus solely on the walls of the museum, few utilize the floors and ceilings as part of the exhibit. 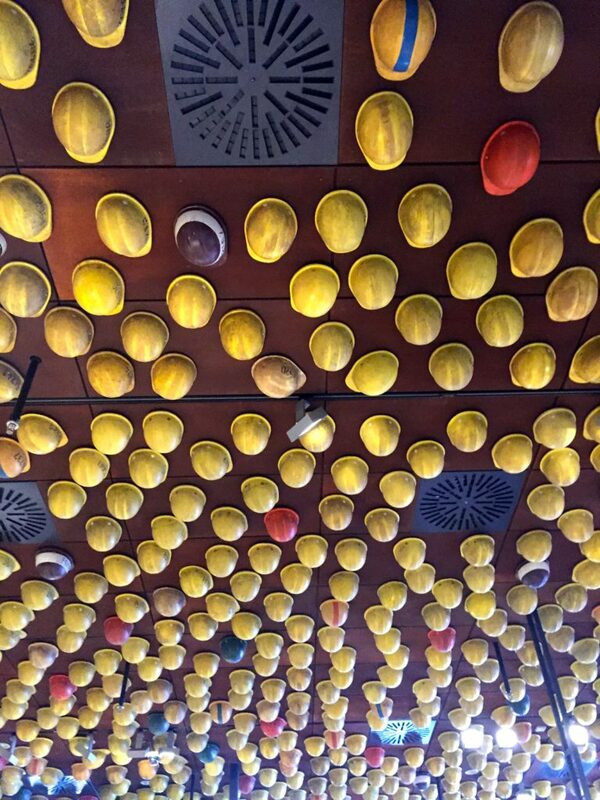 At the Solidarity Centre the ceiling was put to use, featuring hard hats of workers who went on strike during the beginning of Solidarity. This aspect of the exhibit helps immediately immerse a visitor in the museum. The second design feature that stood out to me was in Hall C, which focuses on the unexpected freedoms Solidarity won beginning August 1980, and lasting for sixteen months until it was banned under martial law. This section is magnificent thanks to the way the freedoms and subsequent recall of freedoms are displayed. Taking up almost the entirety of the room is the logo of Solidarity, and within the logo there is information relating to the freedoms Solidarity won. There is also information outside of the logo, all of which is related to the freedoms stripped from Solidarity. It’s interesting how everything inside the logo relates to the freedoms, while everything outside focuses on martial law and forces that tried to destroy Solidarity. The final design highlight that stood out to me was the additional hall at the end, the Pope John Paul II hall. This room is entirely white, with a quote by Pope John Paul II featured on the wall. This room was meant as a place to give a moment’s reflection on Solidarity, and to the left of the quote is a window which faces the Monument of the Fallen Shipyard Workers 1970, which commemorates the people killed December 1970 protests. The European Solidarity Centre was an enjoyable museum, thanks not only for its interesting history, but for its creative take on showcasing history. If ever in Gdansk a trip to the European Solidarity Centre is a must. 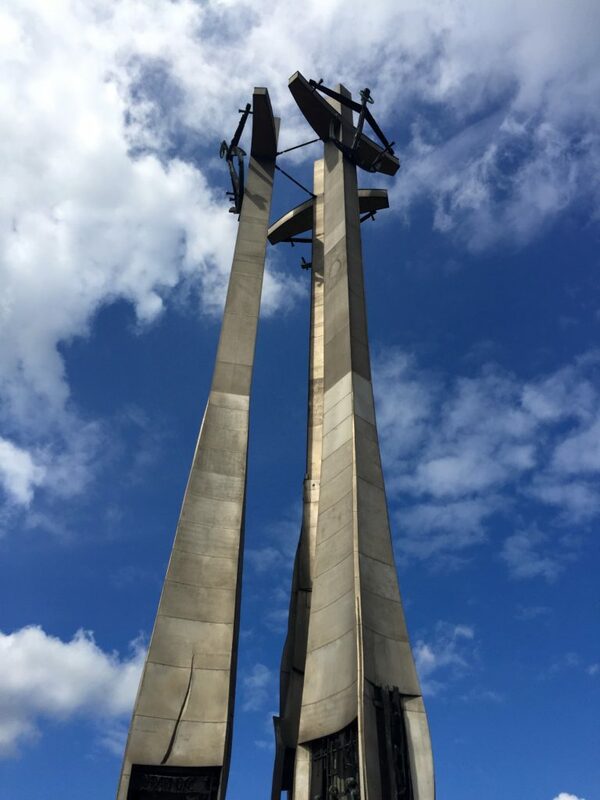 This entry was posted in Europe, History, Travel and tagged gdansk, history, Poland, solidarity. Bookmark the permalink.